The friendly staff recommended we tried the Yeah Mon! 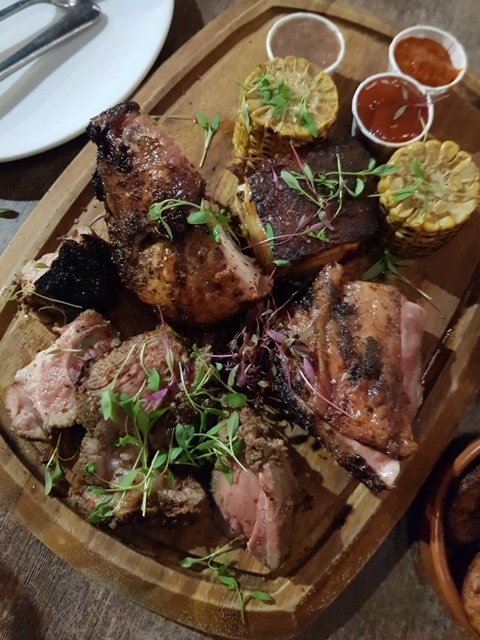 Platter (£29) for our main, and this proved to be a gorgeous mountain of meaty goodness containing a wonderful selection of jerk chicken, pork, lamb and sweet corn. We thought it would go well with fried plantain (£3.50) and rice & peas (£4) which had the right texture to pair with the juicy meat in front of us. Our personal favorite was the pork belly. The crackling was wonderfully crackly and the flesh was succulent and delicious and had cooked to perfection. The chicken was also very tasty and had been cooked on the bone. It was moist and best eaten with fingers so that you could chew all the way to the bone. 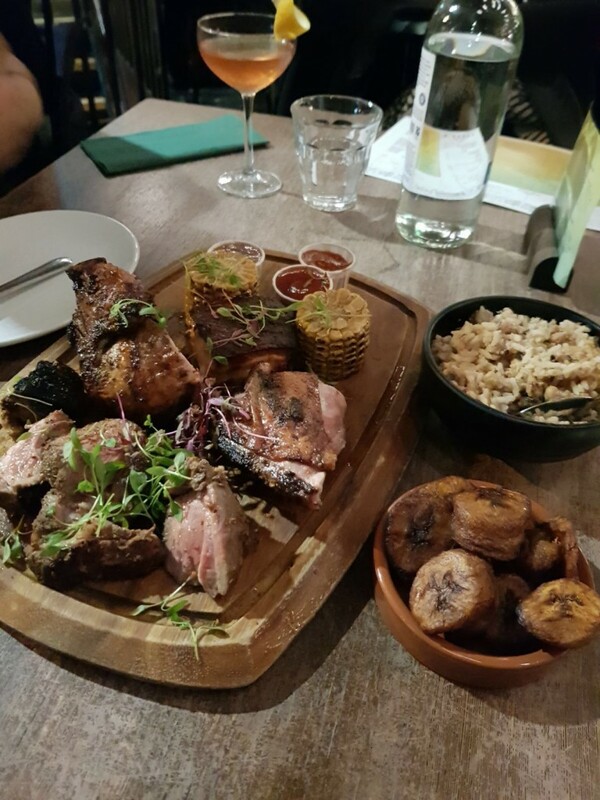 Last but not least was the lamb which was fabulously tender with a gentle smokiness coming through from the charcoal proving to be delightful…Yeah Mon! Now let’s talk sauces! Our Yeah Mon! Platter came with three mysterious little paper pots and we initially had no idea what these were as they had not featured on the menu. After speaking with the staff, we discovered that these were a Classic Jamaican, Papaya and a Banana Sauce. The sauces were all homemade and varied in their level of heat intensity, sweetness and spiciness, with the Jamaican sauce being superhot, to the banana sauce being sweeter. It was exciting to go bit by bit and play with different combinations of meats and sauces. The sauces were all fabulous and deserved to be in the spotlight. To finish we went for a Banana Brulee (£5) and a Rum Cake (£7.50). We shared and tasted both, as you do. 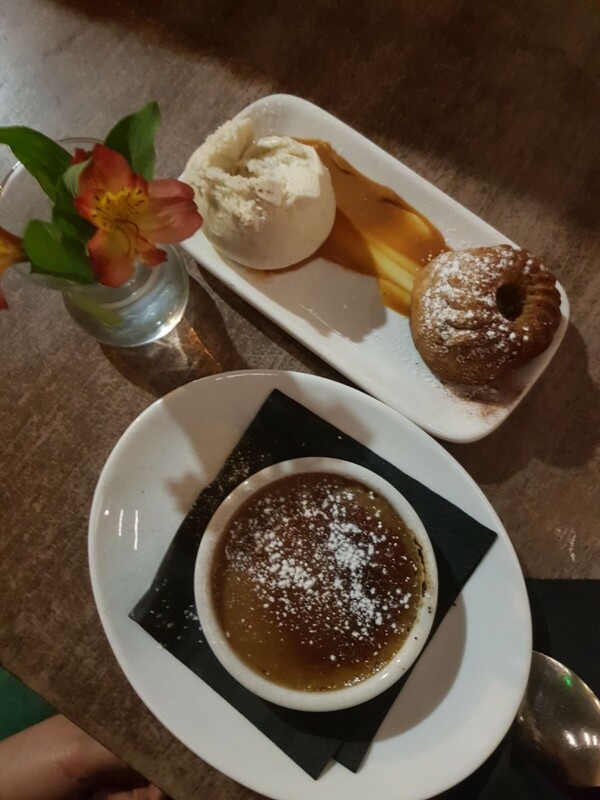 Elika adored the brulee as she’s a big fan of banana desserts. But technically it didn’t quite live up to a brulee in texture as was quite grainy. Agirlhastoeat wasn’t a fan of the brulee. With the rum cake, the first plate we received was very dry and we were not impressed with it at all. But the staff sent out an improved real version and round two turned out to be a deliciously boozy and moist cake, heavenly matched with vanilla ice cream. 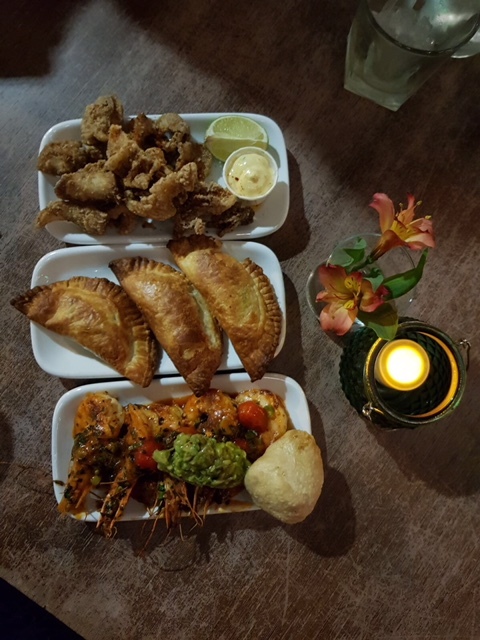 But in the round, we felt that desserts were a strong point at Rudie’s, at least in comparison to the savoury items on offer. 1) The desserts were the weakest link. Price: About £25 to £35 a head, excludes drinks and service.